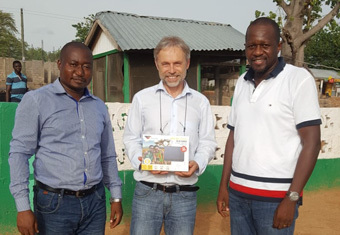 At the beginning of June 2018 EnTri’s Managing Director Klaus Tritscher conducted an extended trip in Ghana at the occasion of cooperation-talks with the long-lasting partner NorthLite Solar Ltd (Bolgatanga, North-Ghana) as well as further potential partners from Ghana and Burkina Faso. In course of the trip a number of PV installations of NorthLite Solar have been visited in the Northern part of the country. Having implemented rooftop solar PV installations private and commercial customers often achieve huge cost-savings in regard to their energy costs. With tailor-made battery-solutions continuous electricity supply is safeguarded. Also the exchange of experiences with local distribution partners regarding the ongoing project with the Styrian company SunnyBAG was very fruitful in view of the further design of the project. The owner of the private company Energea from Burkina Fasotook over a SunnyBAG “PowerTAB” for extensive testing under local conditions. A cooperation between the companies regarding Burkina Faso is envisaged.